Here at Uncyclopedia, the only thing we like more than voting, whoring ourselves around to get votes from voters, making sure the vote score is up-to-date on articles we've written that are being voted on, having the most number of votes (or at least having more votes than someone else), and receiving awards from voters as a result of having received the most number of votes, is seeing our names in print for the achievements we've received awards for. Some strongly feel that this is because Uncyclopedians love lists almost as much as they love votes, while others argue it is a logical extension of the fact that lists are comprised of individuals who've become notable as a result of being extraordinarily talented vote whores. Whatever the truth, everyone can agree that it's nothing to be proud of. So welcome to the Hall of Shame, and please, hang your head accordingly. Romartus 9 Herod the Great, Whigs, UnBooks:Keith_Richards (collaboration with Funnybony ), Dylan Thomas (Rewrite from existing stub), Augustus, Herman Cain (with Magic Man, Mattsnow and Socky), Titus, UnScripts:Titanic Wireless Transmissions Conspiracy, RMS Olympic, Helen of Troy, Julian Assange (with help from Rei ). 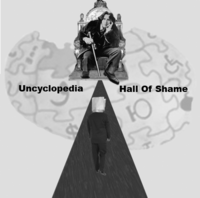 For artists who've scored a hat trick (3 featured images, or better) in the game of Uncyclopedia. This page was last edited on 29 August 2012, at 07:12.